1948 CorrectCraft single axle trailer, shock absorbers, torsion bar suspension (a rarity for it's age), coil springs, tires nearly new, 90% tread on tires, battery new in 2007, boat refurbished in 2000, is very collectible, Johnson SeaHorse, 2 cycle motor purchased new in 2000, fire extinguisher, also has 1954 Johnson SeaKing 25 HP trottle motor included w/sale. If you're looking for a piece of history look no further. 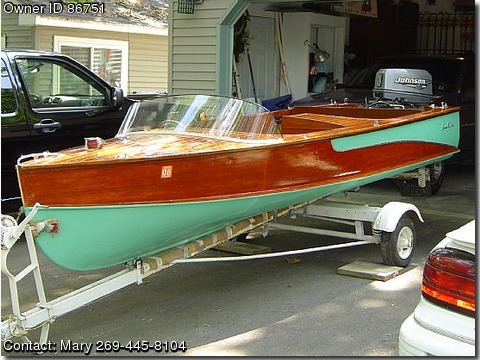 Just looking for something to spend leisure time cruising in the only wooden boat on your lake? Want to fish – good for this purpose as well. Due to the economy and changes within our family – we are selling this piece of our lives. Price is negotiable, and we are motivated. Was $20,000 now priced at $12,500.